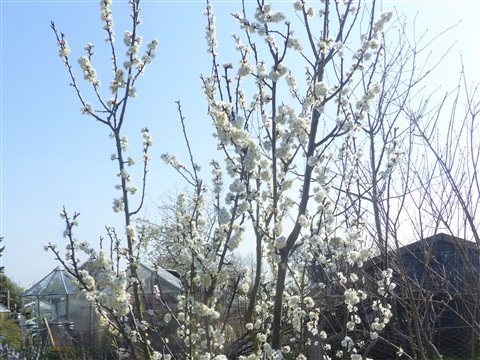 15th April - The Hungry Gap is upon us alright, between the end of overwintered crops and the beginning of the new year's fresh harvests. 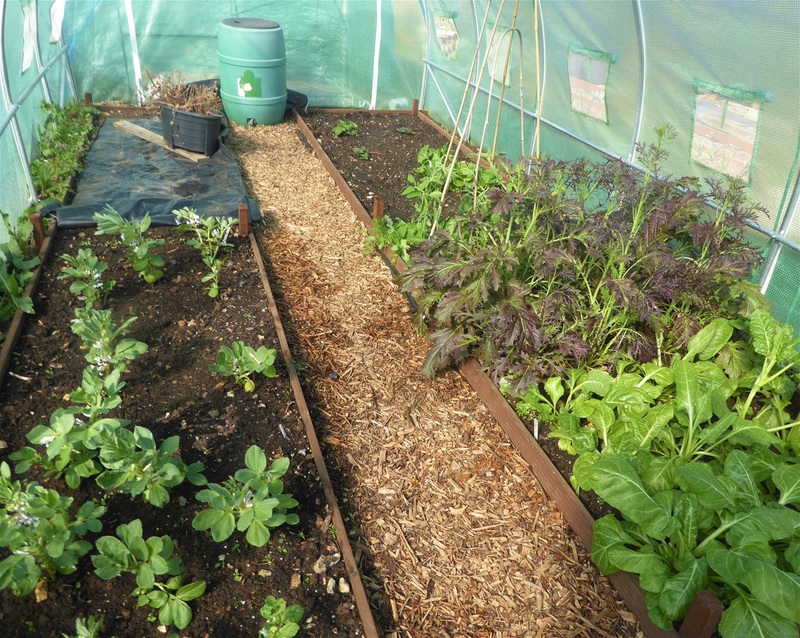 Ours are mainly from the polytunnel, where the extra protection extends the growing season at both ends. 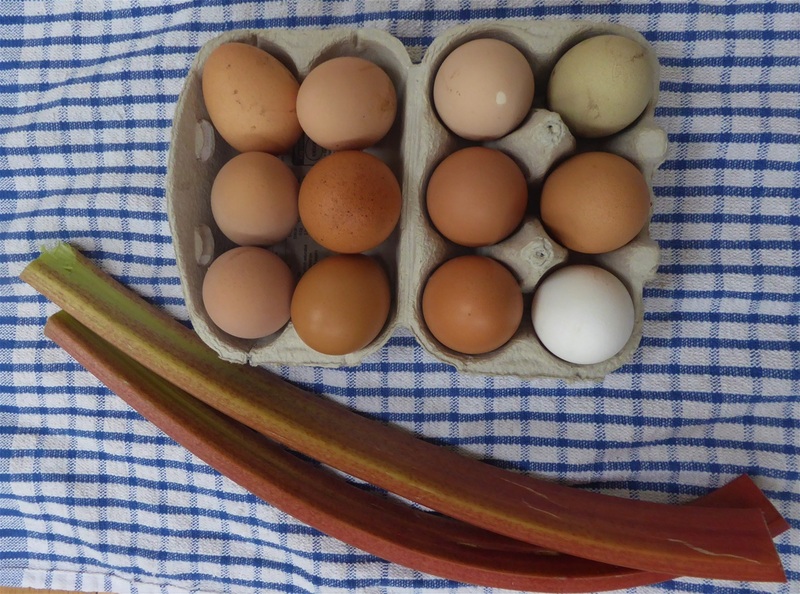 At the weekend we had a huge Rhubarb Crumble, made by my ten year old grand daughter, with a minimum of help. The topping included chopped walnuts and powdered ginger, and it was very tasty indeed. Well done, Pearl! 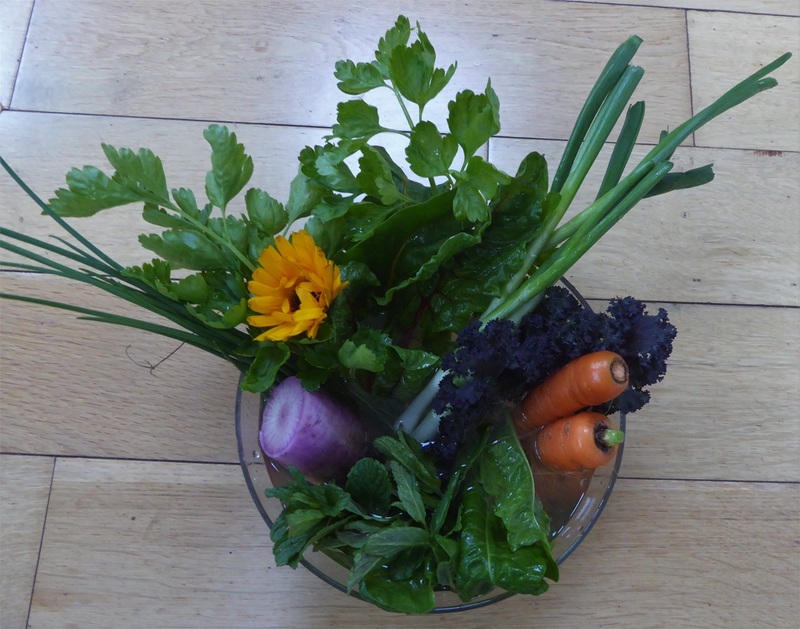 Her elder sister cooked lasagne, which included carrots from the compost-box in the garage, and some of the stored shallots. Thank you Poppy, it was delicious! The dry weather has given time to get up to speed with the jobs. 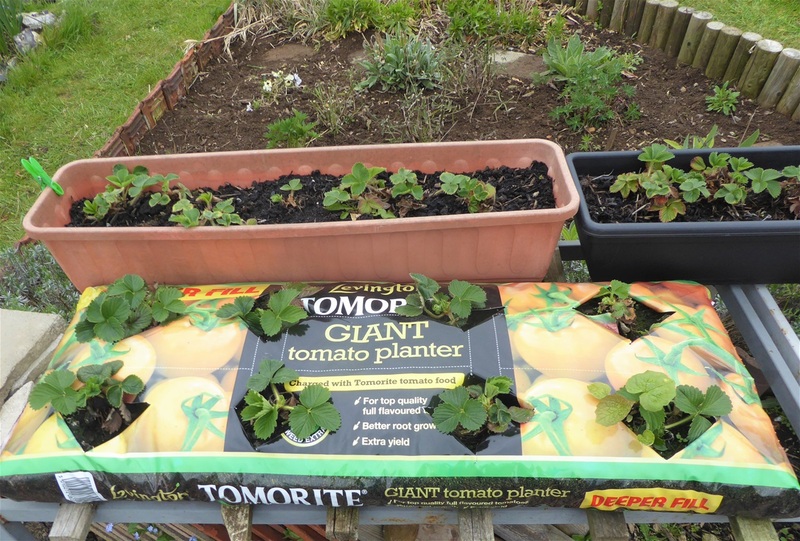 There are some new strawberry plants, put into a large temporary raised bed, which came as a free gift with the plants. It did not include the compost of course, but was very welcome regardless. 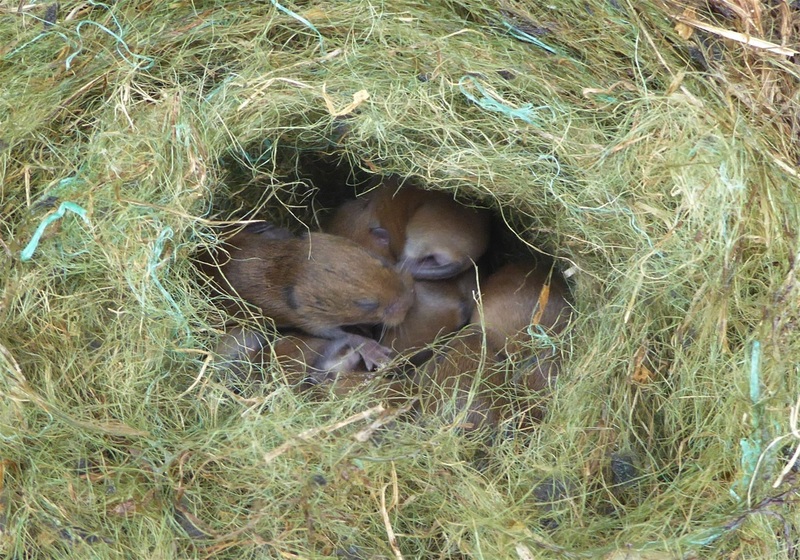 It is always heartening to see evidence that things are actually growing. 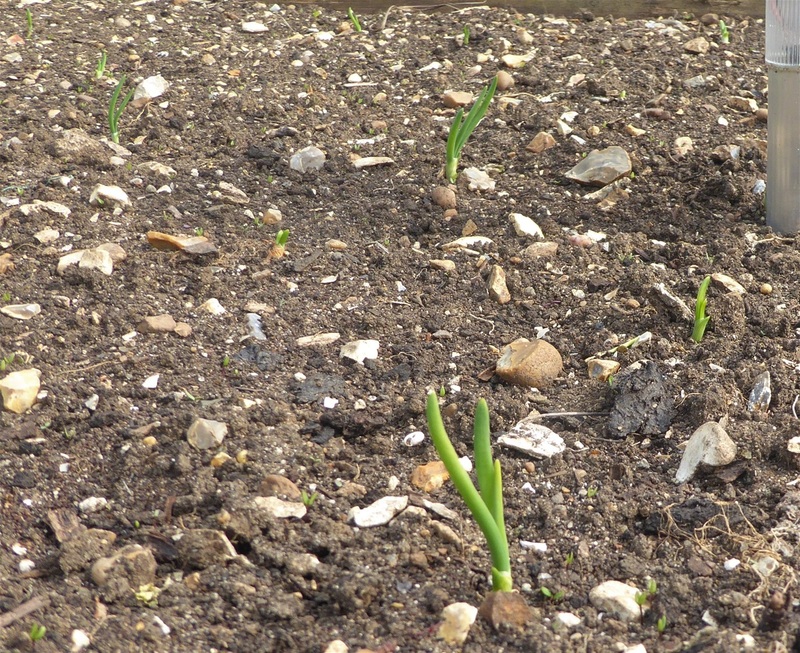 Onion sets grow roots relatively quickly, but of cousre you don't see this happening under thr ground, but when the green shoots start to show, you know they are really on the way at last! 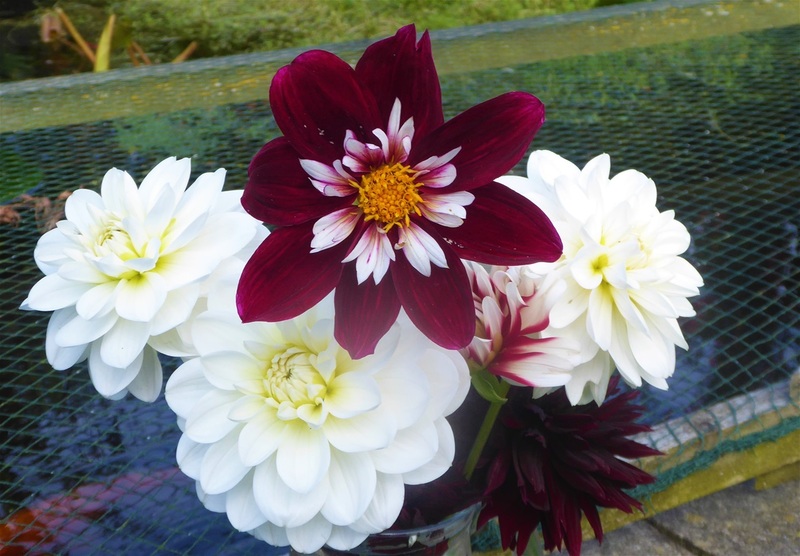 I soent just over three hours today planting Dahlia tubers that have overwintered under the staging in the greenhouse. Some were a bit shrivelled, but will still hopefully grow, although the majority did have tiny shoots beginning to develop: a sure sign they need to be in the ground. 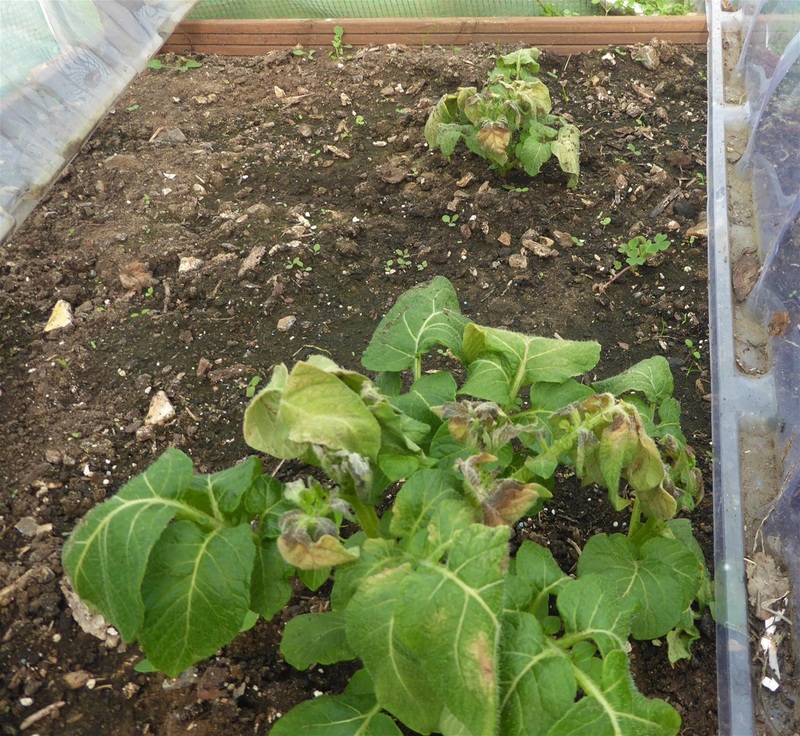 It was so cold that the potato plants in the polytunnel were caught by frost, and patches of foliage were damaged. It took me by surprise, so I hadn't put cloches over them. My new max-min thermometer showed that the lowest temperature in the tunnel was -1.6C, which means it was roughly -4C outside. 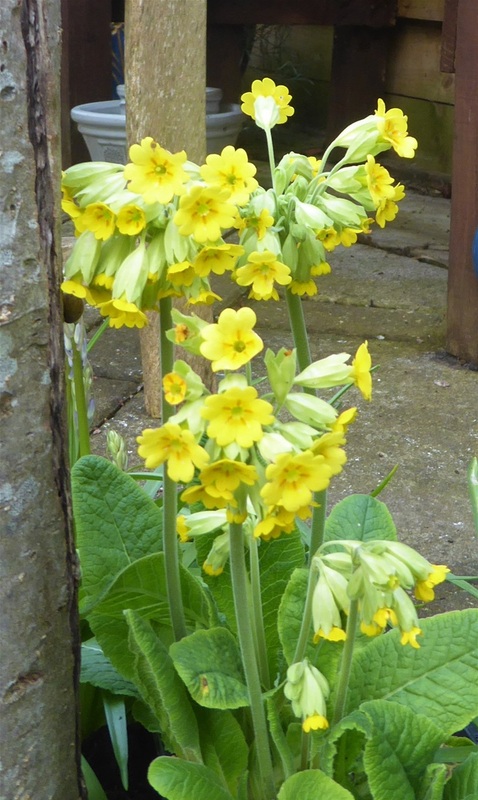 One of my favourite flowers are Cowslips. When I was a child these all but died out in the local countryside, and my Dad grew some from seed so that he could nurture them in his garden. He gave me some of the plants, and all those in my garden ara descendants of those originals from Dad, so are even more precious. 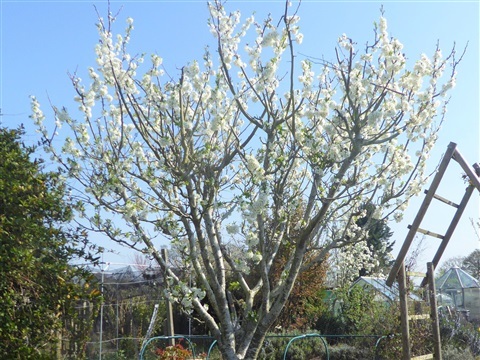 They spering up between the paving slaabs on the rear patio, and in the bonsai pots, as wel, as around the base eof the Golden Delicious apple tree that used to grow in his garden. Abi & I brought the tree to Reading on the train, and it came to the house we later moved to, on the roof of a friend's car It must be at least 50 years old and it still produces gorgeous late apples. We always used to let our son pick the first one off the tree on his brthday in early November, and the apples store really well. There are still some in a tray in the garage that are perfectly good to eat! Next week it will be time to open up the packets of squash seeds and decide which I shall grow ths year, and to plant the sweetcorn seeds too. A little later than most years, but I am trying not to sow things so early that they are crammed into the greenhouse, unable to be planted out because of the cold, getting pale and thin in the process. Despite the cold wet weather, I feel optimistic that the plots are more or less up to speed again. I did have some help from one of my nephews, who travelled over on the train on the wettest day of the week to help me plant potatoes... thank you Khalid! Harvest Monday starts with a new vegetable to the table: Lettuce. 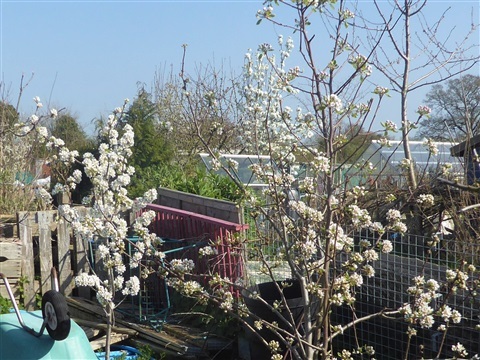 This is Winter Density, an old English variety which is very hardy, and copes well with a minimum of protection from cold and wet. 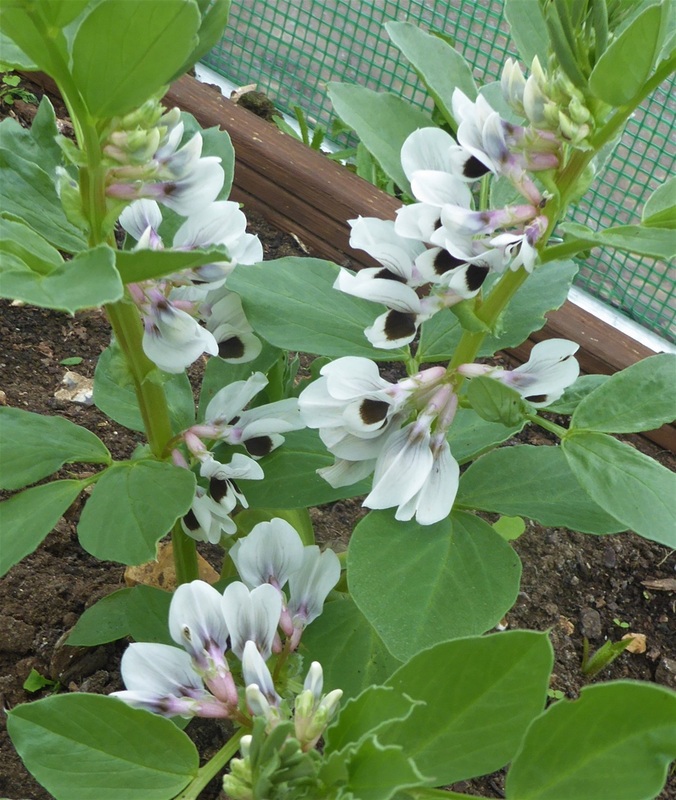 These are growing in the polytunnel and are now hearting up. 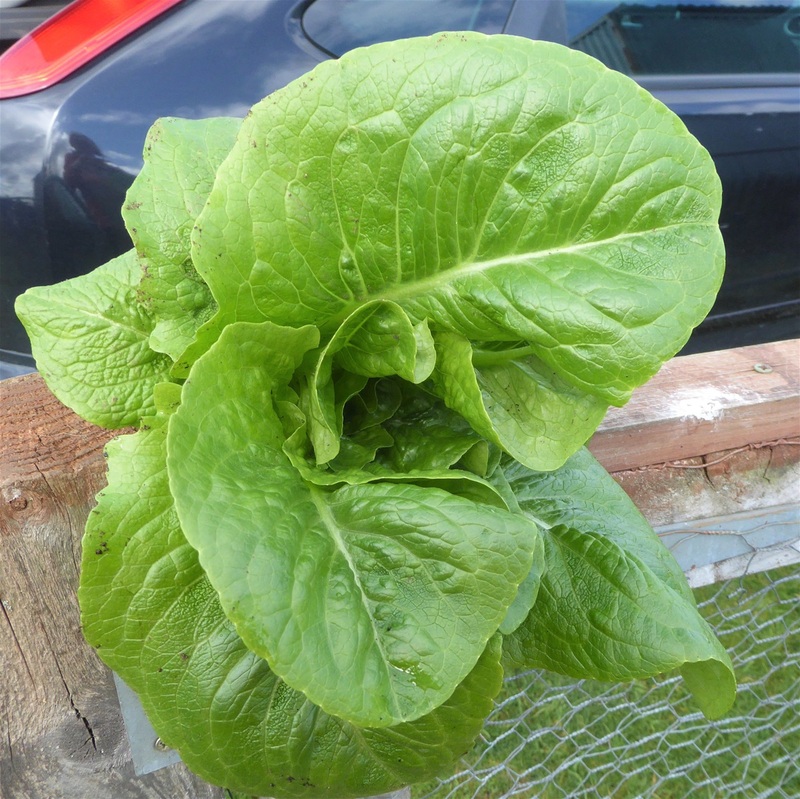 Lovely to have the first lettuce of the year! All three of these are starting to grow flowering stems, which is kind of the beginning of the end for the mustard and spinach. 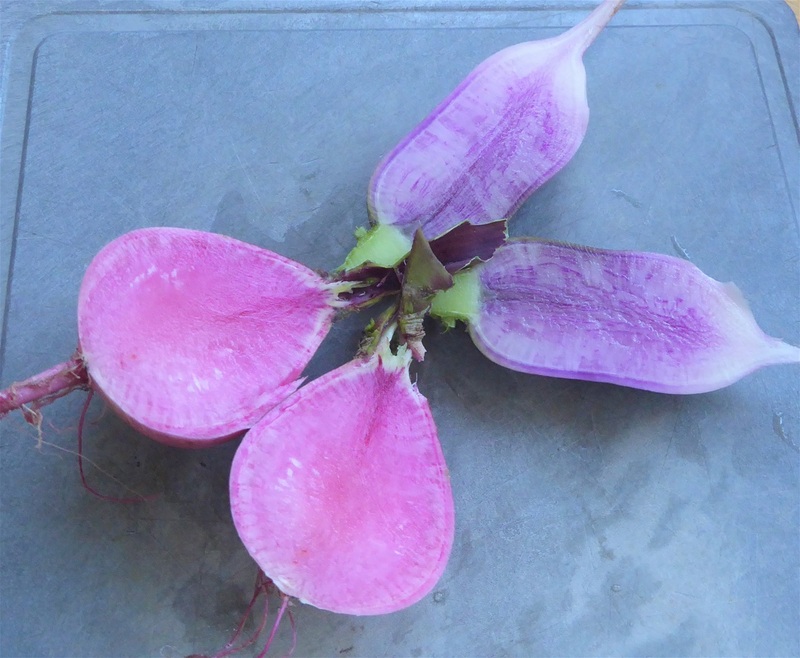 The mustard flower stems are very tasty in stir fries whilst still in bud, similar to skinny Sprouting Broccoli shoots, but the Perpetual Spinach is a relative of beetroot rather than a true spinach, and their flower stalks are thick and tough. 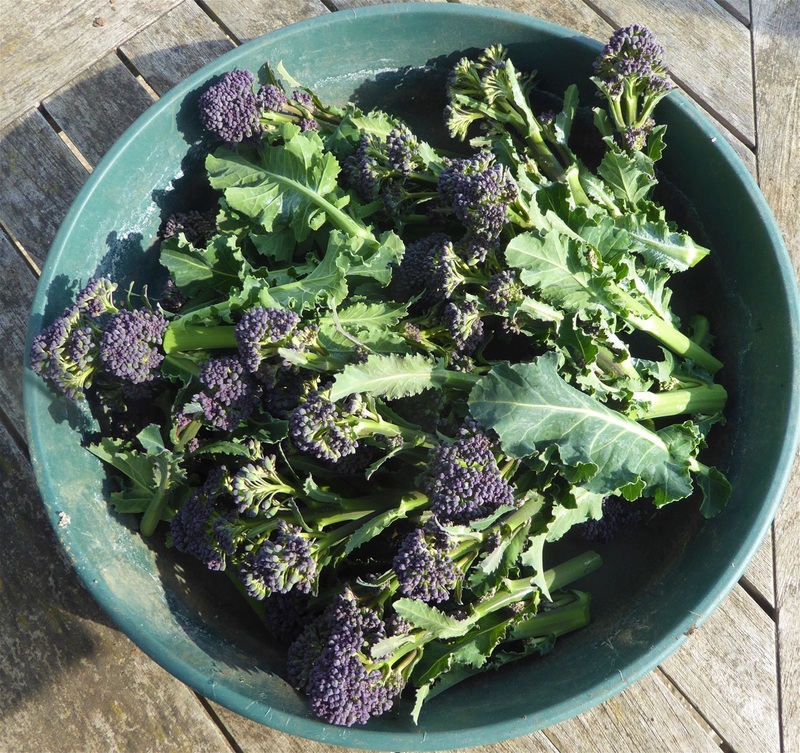 Purple Sprouting Broccoli is still going too, although the stems are now much thinner as they come to the end of their usefulness. 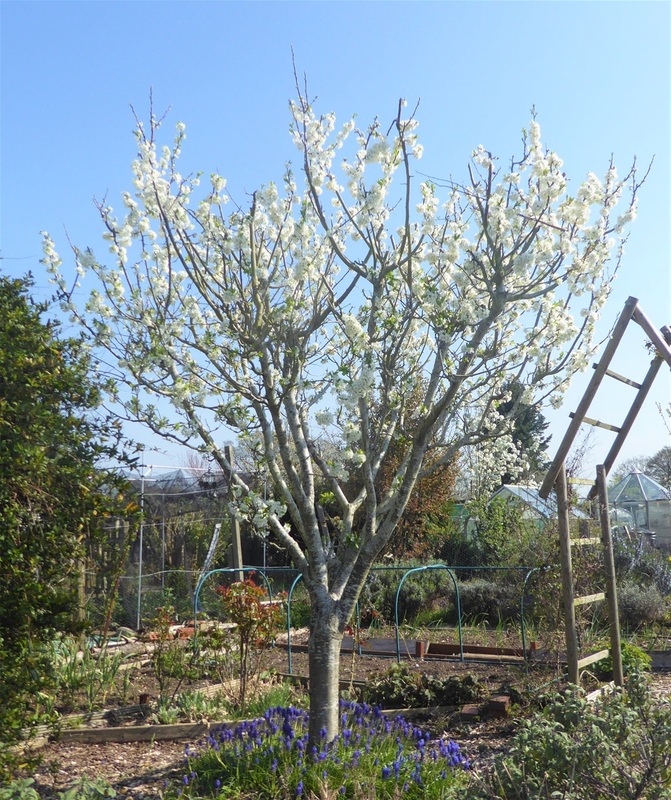 The young top leaves are tender still, so I shall be picking some of these in the coming week. As I said, this week has been a sort of turning of the corner on the plots. 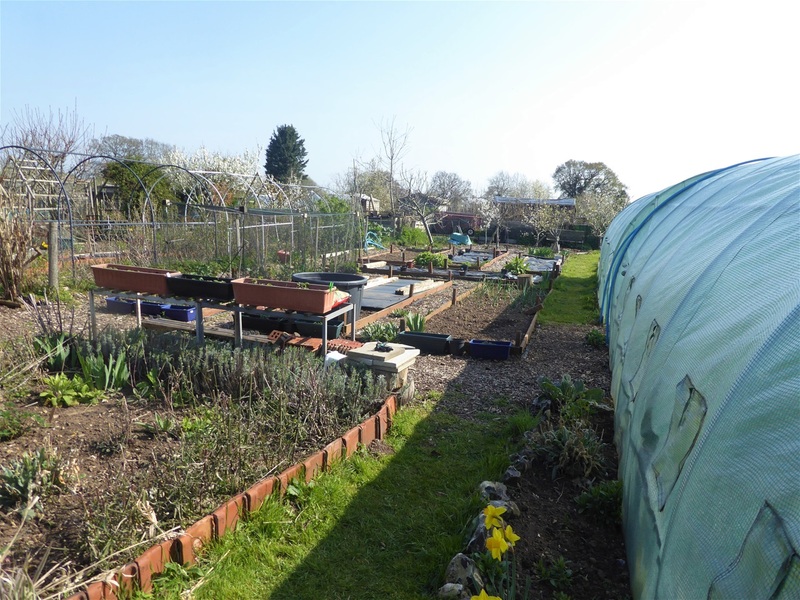 Most of the beds are now uncovered and planted up. The second early potatoes (Kestrel and Maris Peer) and the maincrop potatoes (Setanta and Pink Gypsy) are planted. 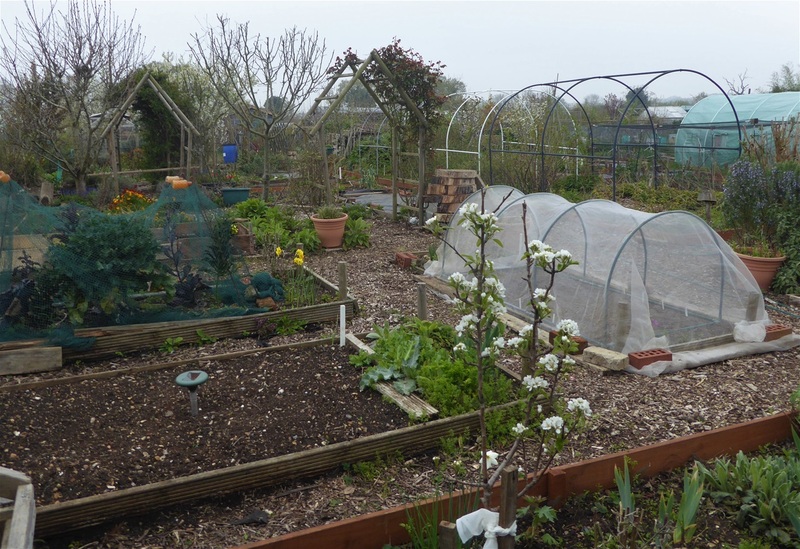 It was really apparent this year that it has been worth covering the beds, as the soil was warm and workable under the plastic, and the tubers will get off to a good start. 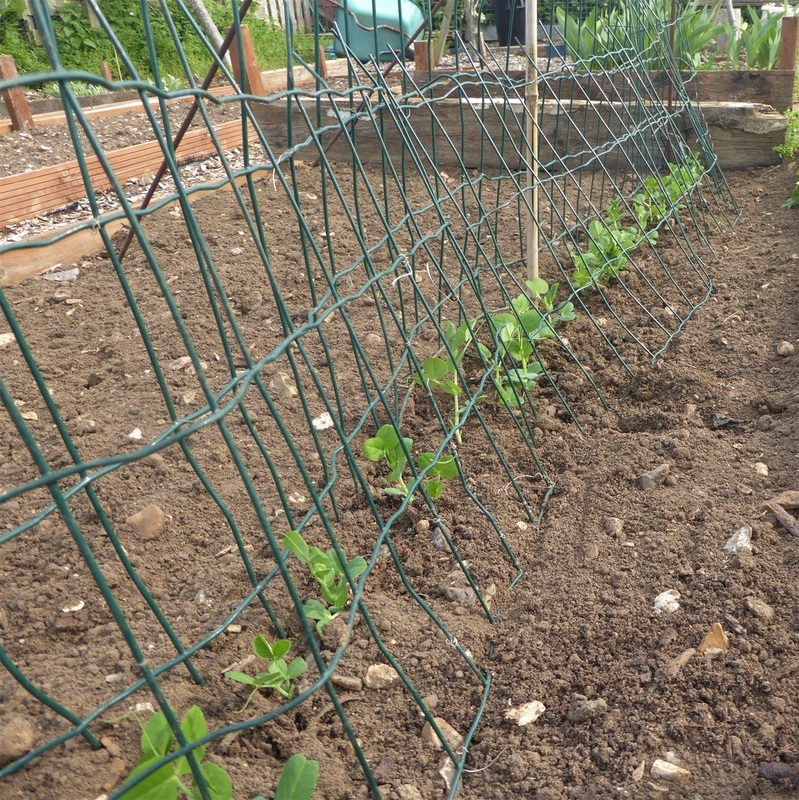 As with the earlies, I have reverted to my old planting method, planting in holes organised in rows; earthing up the new shoots as they appear above ground will be easy. 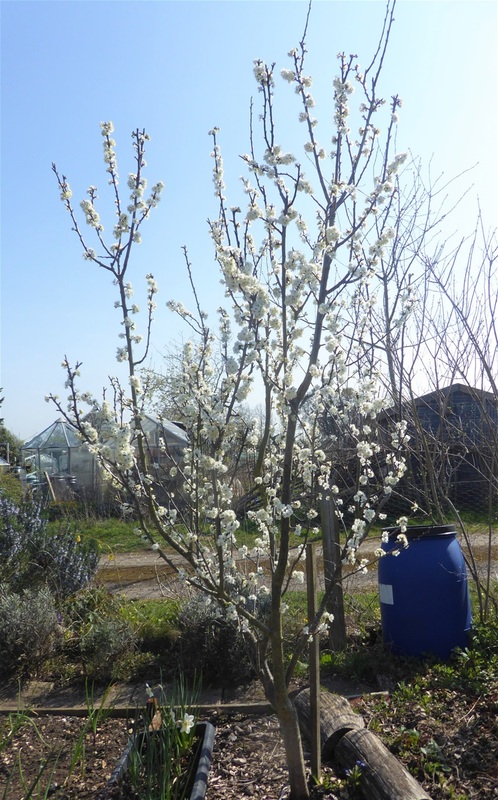 Something different this year though is that I added shellfish compost to the soil, which contans chitin. Chitin is reported to help with moisture retention and also supports soil bacteria and so increase disease resistance in plants. I had the chance to buy some at a modest cost, so thought it was worth trying. After all, the soil is the most important resource we have, and we expect it to work hard for us so a bit of care for the soil organisms has to be a good idea. Last week I talked about the issues with germination of parsnip seed. The recent heavy rain did give the ground a good soak prior to me sowing the seed, which was good. One packet was Gladiator ...new seed... and one was an unopened packet of Tender & True from last year. I shall be interested to see what difference there might be in germination rates. We are always told parnip seed needs to be as fresh as possible, so we shall see. If it is only the Gladiator that grows, I shall still have plenty of parsnips! I have covered the bed again, and will be checking every few days to see when germination begins and then I shall take off the plastic. 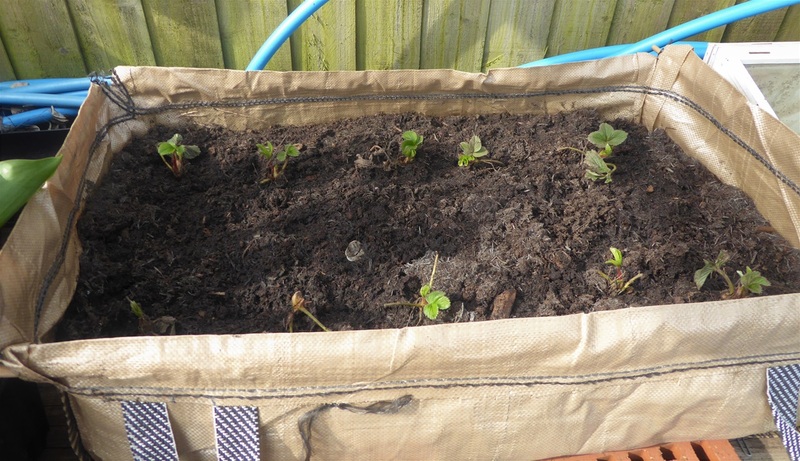 The strawberry plants have started growing again and it shouldn't be long before flower buds are visible. There is no sign so far of the damage to the foliage that was happening last Autumn. The large triangular flower bed , which is visible behind the strawberry table, is weeded now and the Verbena bonariensis plants dug out from the edges. I replanted three in the middle, and gave away the remaining ones to other plotholders. This provides space where I can put in some of the plants I am growing for cut flowers, and easily reach them too. Carrots are now also sown, although the prep for this took hours. The frame to support the netting had rusted through along the base: thin canes and duct tape seems to have done the job for now. 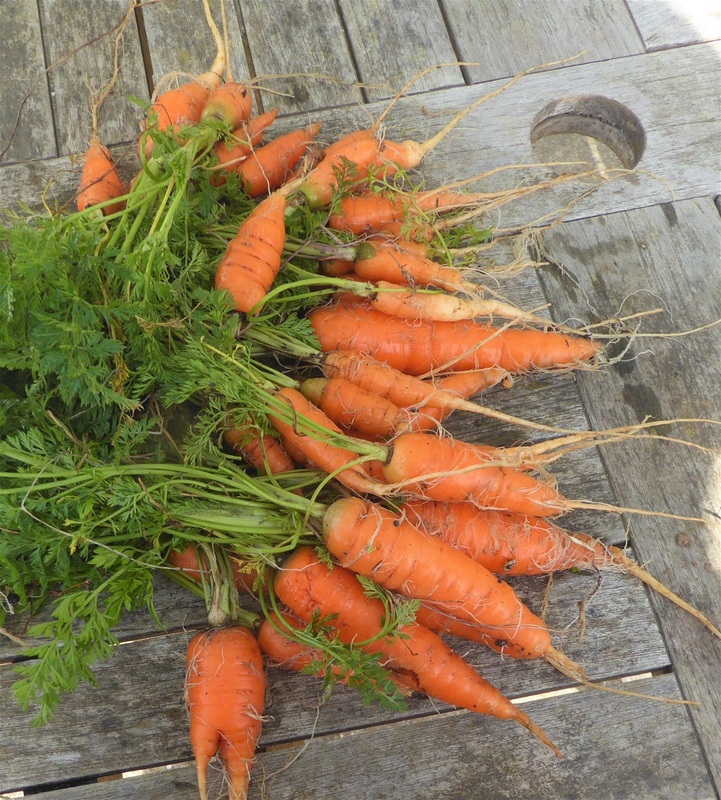 Taking out as many stones as possible from the soil, incorporating sand and a sprinkle of seaweed meal before tamping the surface down lightly with the rake head was a long job, but worth the effort to try to grow carrots that are a decent shape. At long last, the remaining Asparagus crowns arrived, so now six Pacific Purple and six Gijnlim are now resident in their new bed. Plenty of sand and seaweed meal have been added to the soil, and the plants were sat on a ridge with theo crown about 4-5cm blow the surface and their long leggy roots draped across sideways. They were then mulched with a 3-4cm layer of compost. 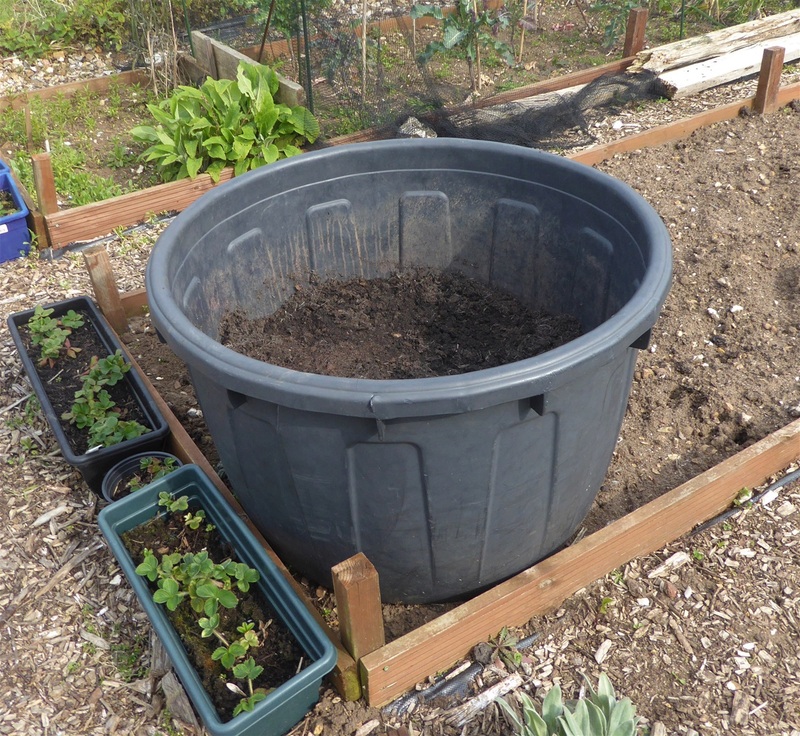 In the photo, only two sections have compost added, as I need to dig more out of the bin for the middle section. 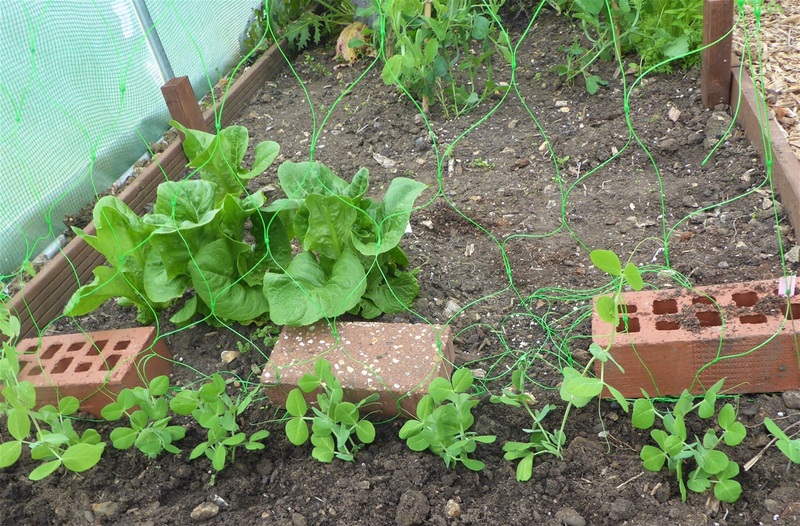 The mangetout plants are planted at the base of the netting so that they have support as they grow. 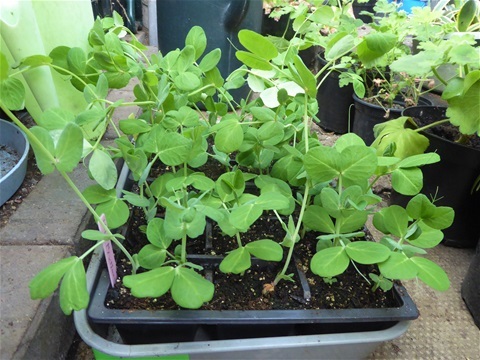 I took off the spent pea seeds from the base of the plants, to make them less attractive to passing mice. 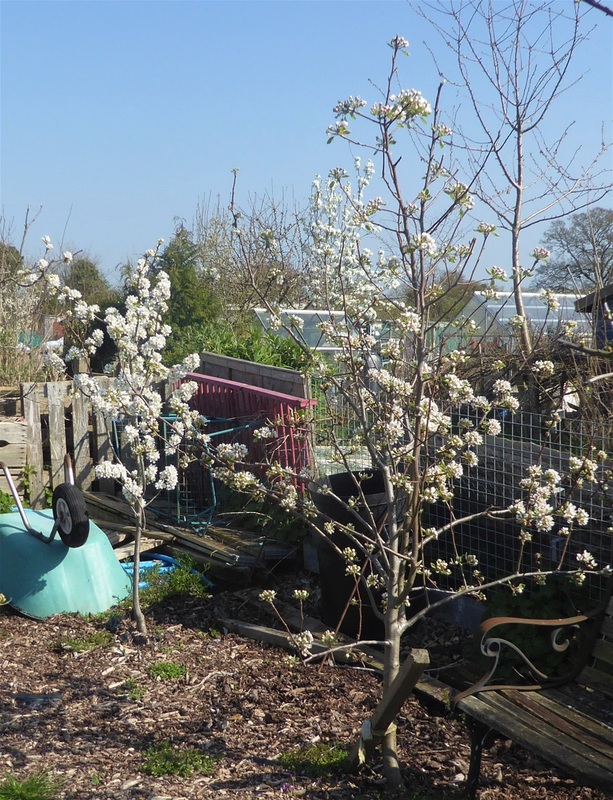 It is a fiddly thing to do but if it means the plants survive, it is worth it. 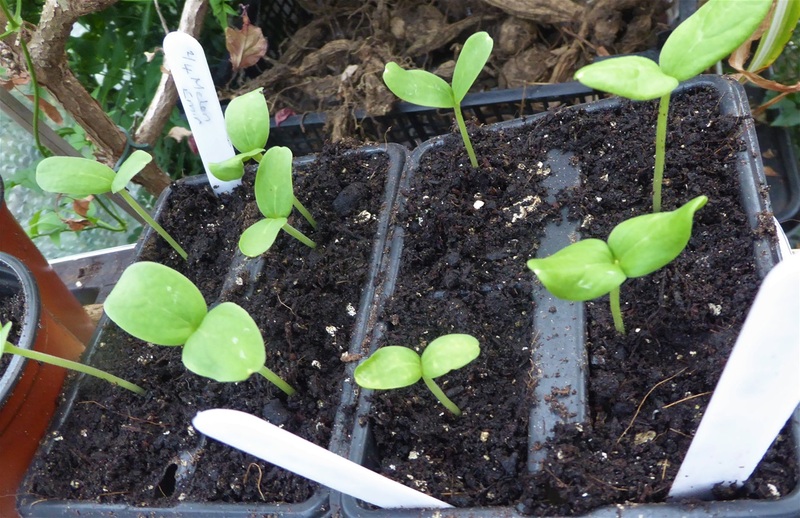 At home in the greenhouse, the cucumbers, cornichons and melon seedlings are now enjoying brighter light than they had in the propagator on the windowsill indoors, and the tomato and malabar spinach seedlings will be joining them tomorrow. 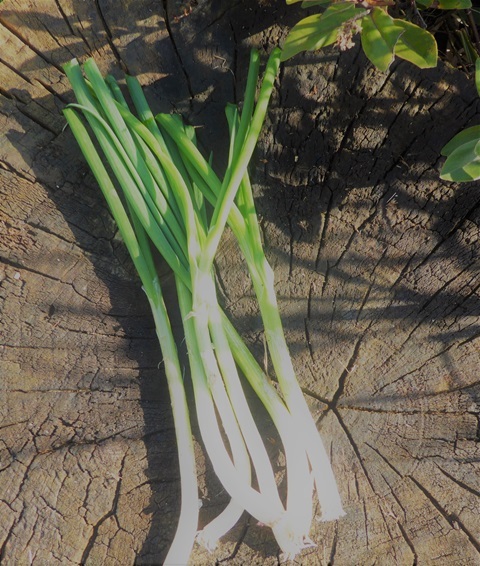 Needless to say, the geenhouse is groaning at the seams: the modualr tray of Spring Onions will be off to the polytunnel on my next visit. 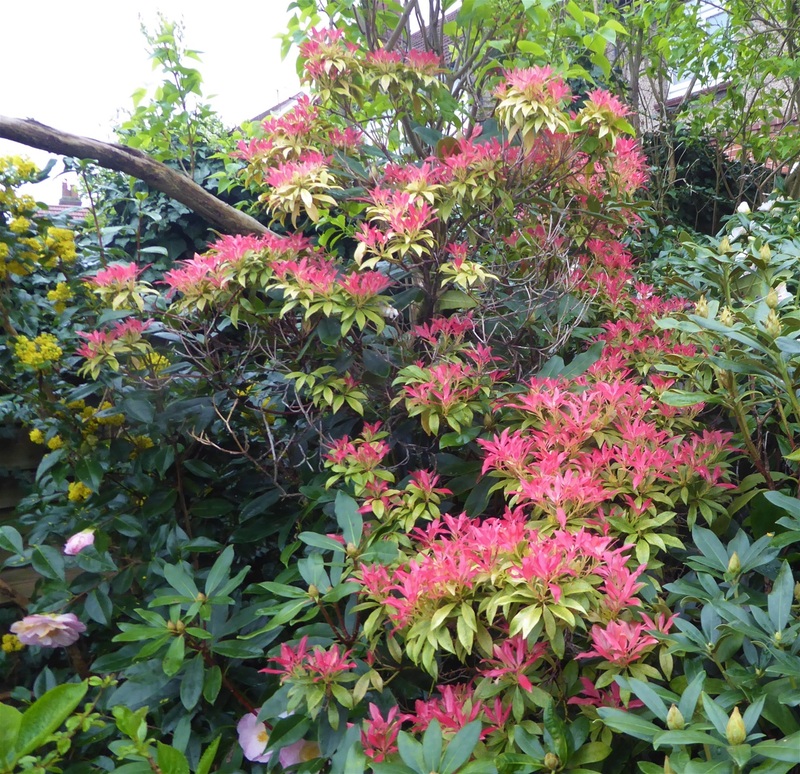 And in the garden, the Flame of the Forest,which looked as though it might not survive two years ago, is covered in glowing fresh growth. I am glad I didn't dig it out! Next up are Spring Onions, which were sown last Autumn and overwintered in the polytunnel. I find that if I sow a few seeds per module, they grow together to fill their compost with roots, and then it is easy to plant them out as a block. 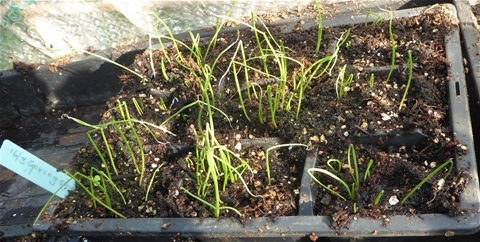 I started growing them like this when we got our plot 9 years ago, because there were so many weed seeds in the soil it was hard to spot the litle thready onion seedlings amongst them. 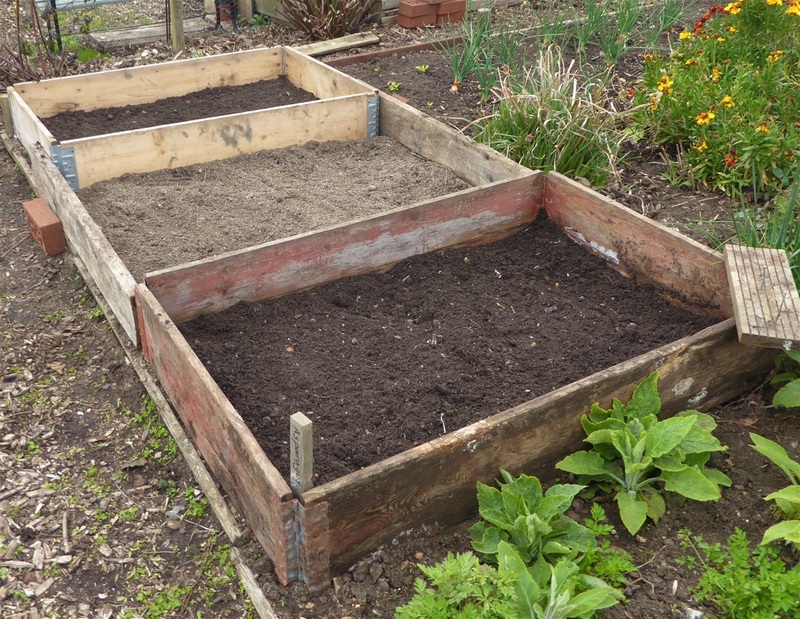 Now of course, the soil on that plot is a dark, crumbly loam and probably Onion sedlings would cope with direct sowing. 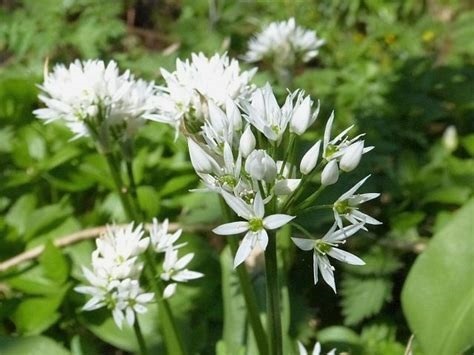 However, the added advantage of sowing in modules like this though is that i can get a crop ready to plant out as soon as a space become vacant and this helps to have a succession of Spring Onions throughout the year. Here is the batch sown in mid-March, which will be planted in a row outside later this month. They look pretty shabby right now, because the temperature in the greenhouse had shot up today, despite having the door open, and the comopost had dried out a bit. I sloshed some water over them with more enthusiasm than sense, hence all the boggled looking compost. They will be fine though. Carrots just keep on coming. I had to dig these up because their bed will be used for maincrop onions, although I did leave one row at the end of the bed for later use. You can see there are lots of hairy roots, where they are starting to grow again. Carrots are biennial plants, and in their second year grow a flower stalk, hence their new growth spurt. I shall leave a few of the remaining row though, as hoverflies adore their umbelliferous flowers. Their larvae consume aphids, so hoverflies are always welcome! 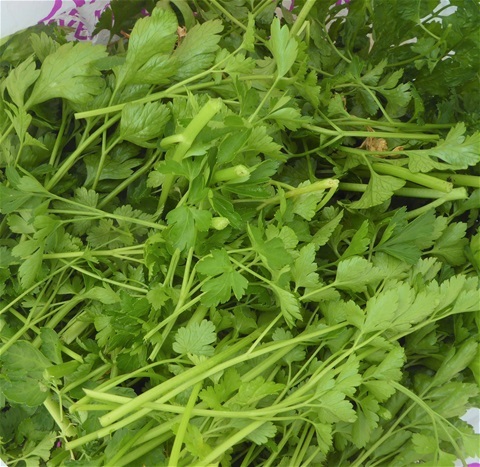 The carrot bed was also full of Flat Leafed Parsley plants, which also had to come out. 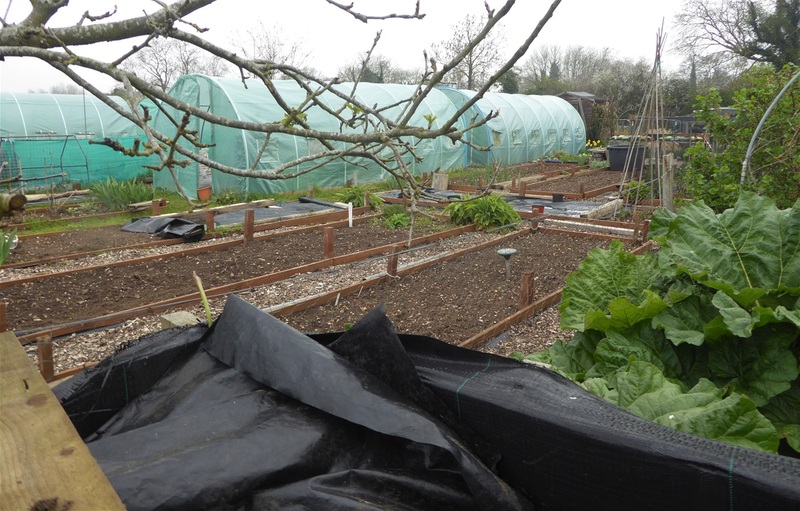 A large carrier bagful of leaves was a lot to deal with, especially as I do have lots more plants growing elsewhere on the plot and in the polytunnels. Pesto made with it was good though. Sometimes people tell me that parsley is difficult to germinate and does not transplant well. . I always leave some plants to flower, which they do in their second year, just like carrots (They are in the same family) and the resulting seeds scatter far and wide. These self sown seeds come up all over the place and small seedlings can easily be moved to where I'd prefer them to grow. They carry on producing leaves all through the Winter too, which are always very welcome. My original plants came from dividing a potful bought in a local supermarket about five years ago, reduced to 50p because it had wilted slightly. Excellent value, I reckon!! I have made the most of the opportunity to weed this week, as the weather has been dry and mild. Weeding on wet soil makes my gloves horribly muddy and the bucket gets very heavy. I tackled all the flower beds on #145, and they look much better now. 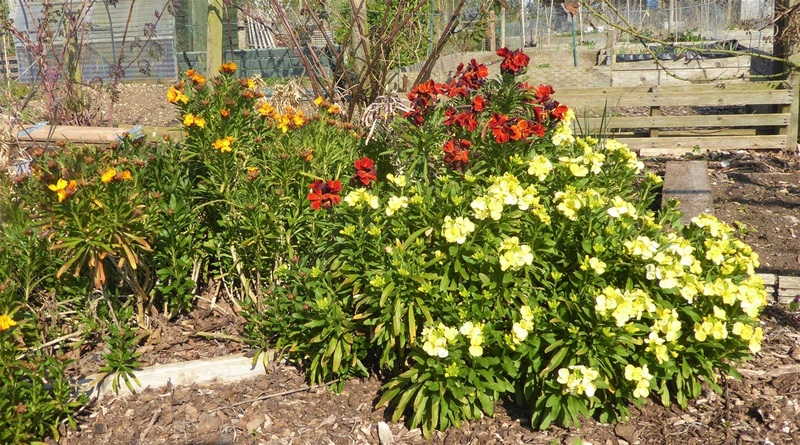 I plan to re-site the Verbenia bonariensis surrounding the edges of the triangular bed into the middle, as it is so scratchy that to stretch past it makes it very difficult to cut flowers growing further over. Maincrop Onion Sets are in: Turbo on #146 and Stuttgarter on #145. The soil is very dry so if there is no rain in the next few days they will need some water. Last year I had all sorts of problems getting Parsnip seeds to germinate, and so it seemed, did lots of other growers. I have never had an issue before, but the unusually dry, warm weather didn't suit them, with tiny seedlings drying out and dying as they pushed out of their seed coats, so..
... a new plan. I read up on how gardeners of old used to help germination along, and one favourite was to water the ground, sow the seed, cover very lightly with soil and then put a plank of wood over the row until germination begins. On the face of it this sounds a little weird, but it would maintain a consistent level of moisture in the soil, and also provide some insulation from frosts too if needed. 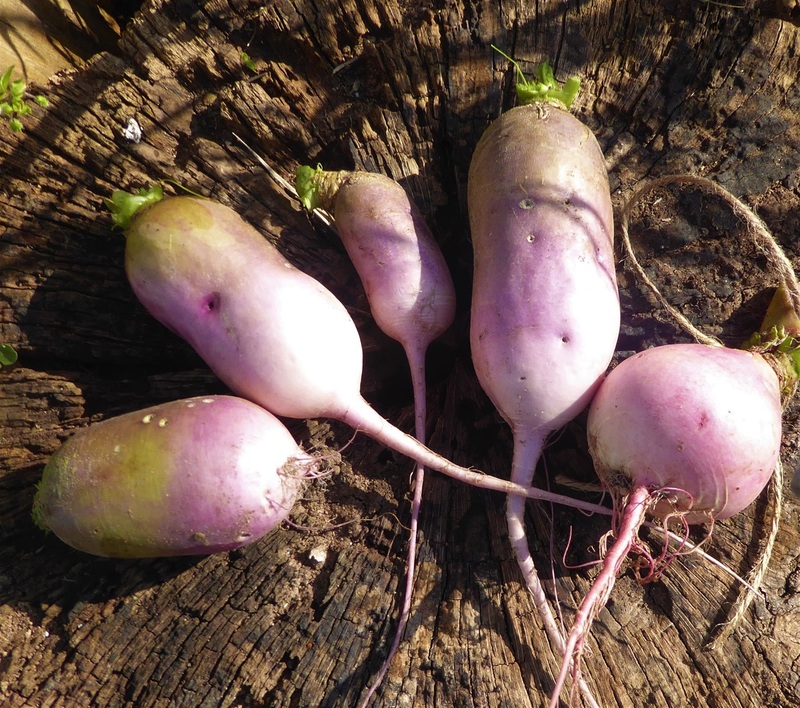 I know parsnips are hardy, but seeds are small and light, and the tap root needs to be able to grow away quickly, which is cannot do in dry soil, as it curls up and dies. Now in theory, parsnip seed germinate in about 3 weeks, but in warm soil (and right now the soil is certainly warm enough) it could perhaps take 2 weeks. I shall be regularly checking for seedlngs, and will then remove the cover, keeping them carefully watered when needed. I'll keep you updated. The Couva Penca seeds failed to germinate so I shall try a second sowing this week, perhaps keeping them indoors rather than in the greenhouse. as it will be cooler during the day. 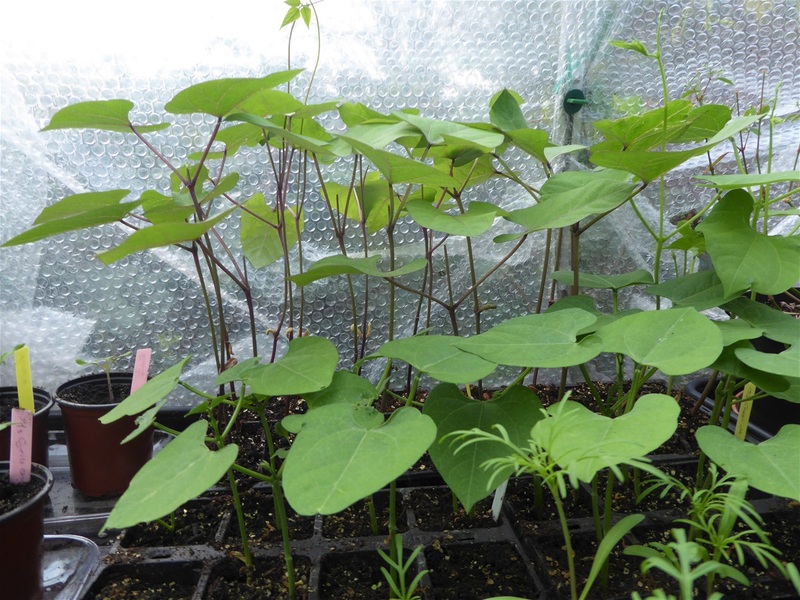 Most of the flower seedlings are now developing their first proper leaves. Hopefully they will continue to grow on in their modules for a while yet. 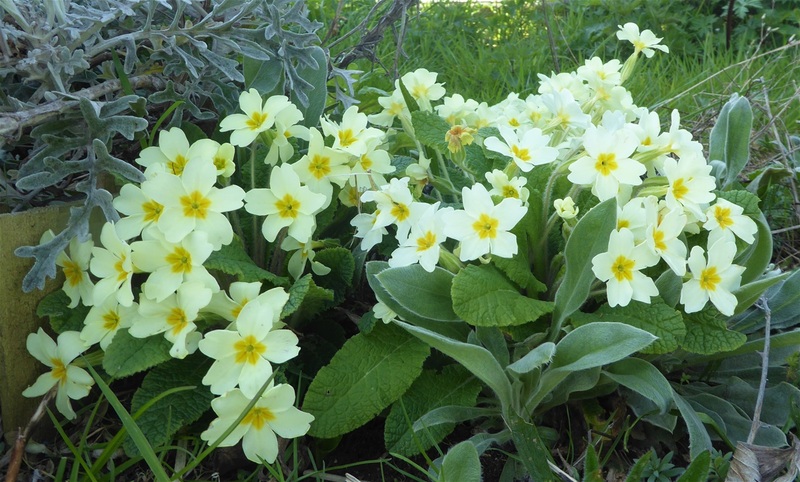 One of the flowers that has been a real,success this Spring are the Primroses. On the plots lots of wildings appeared,, all coming from a few small plants a friends gave me, transplanted from the verge outside her plot. These have really bulked up now, to give beautiful clumps settled in the grass and in a shady bed on # 146. 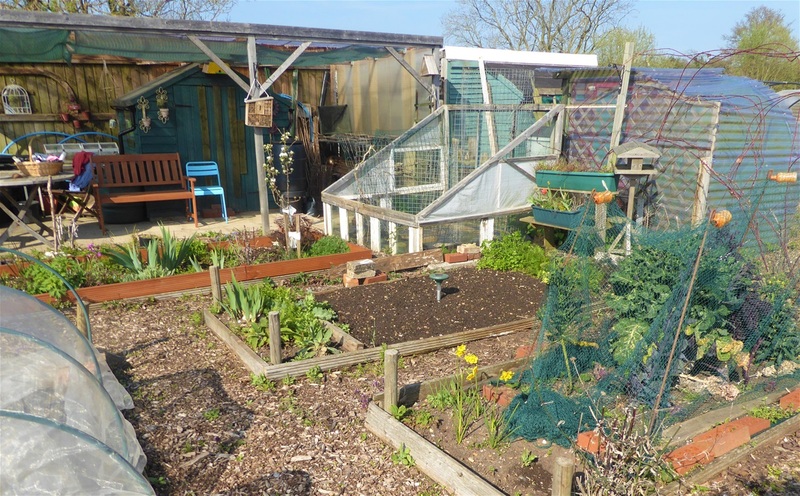 This coming week I plan to sow the seeds of the tomato varieties to grow outside, pot on the seedlings of the varieties that will be planted in the polytunnel, plant the mangetout in the polytunnel, sow the parsnip and carrot beds and plant the remaining seed potatoes. Say it quickly, it doesn't sound too bad!